We have been looking to get a push along walker for Turtle to play with. She is really enjoying standing up at the moment and building her confidence towards walking so we thought she would get some use out of it. After having no luck borrowing one through the toy library we decided it would be a good Christmas present. We looked them up on Gumtree, which is a great place to buy cheap secondhand baby things. It turned out that many other families had the same idea. 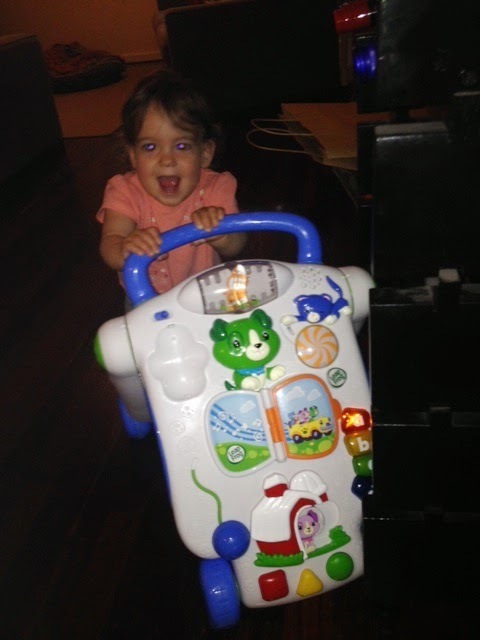 We found a couple of nice Vtech walkers that are about $99 new from the baby store. On Gumtree they ranged from $10 to $40. I have recently limited my travel distance to collect things on Gumtree to within 20km from our home and so we only looked within this range. The first three walkers that we enquired about were all $10 to $25 and all of them had been snapped up before we saw their posts. While Mr Fix It was out salvaging for treasure on Saturday night I decided to check again and saw two walkers had been posted a few hours earlier. One was a Scout and Friends walker and it was still available. We managed to get friends to pick it up on their way to our place for lunch on Sunday too so it was a very good shopping experience. The Scout walker was $20 and turned out to be new and still in its box. Since we are going away for Christmas and won't be taking the walker with us Turtle has been allowed to play with it since we got it. I am so pleased to have found such a lovely toy for Turtle to play with that was cheap and buying secondhand meant that it wasn't wasted even though the first buyer didn't use it or need it. I don't see why it is necessary to buy toys brand new when children outgrow them, or get bored with them, so quickly. I would love to hear about any secondhand presents that you have found for loved ones. Did you feel like you had made the gift more personal by researching and putting a bit of extra effort into finding something that way?